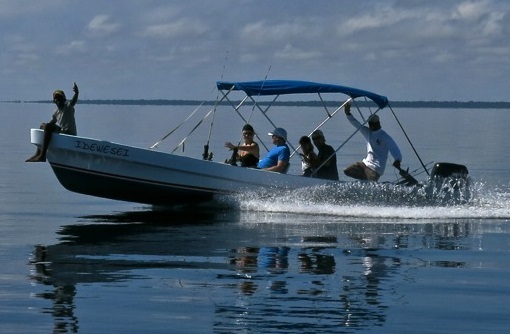 Our 21’ boat, “Idewesei” can accommodate groups of 1-5 people. 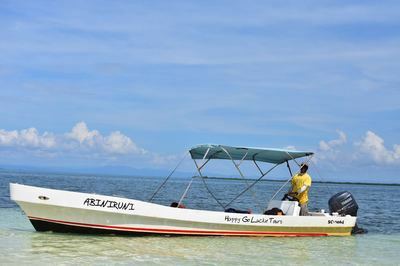 Our 23' boat, "Abiniruni" can accommodate groups up to 6 people. Our 25' boat "Babycakes" can accommodate groups up to 8 people. With all boats we can accommodate groups up to 20 people. All our boats have canopy tops for shade. We can now accommodate larger groups of up to 30 people by special request on one large catamaran, the "Cat's Meow". Contact us for details and pricing. All boats are fully licensed and equipped with safety equipment adhering to all safety regulations. 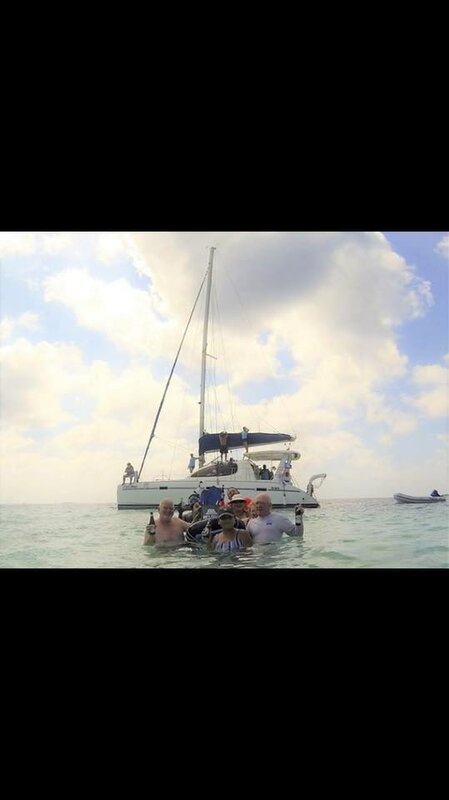 Troy "Luckie" Nunez is a licensed tour guide, boat captain and PADI professional. He has been working in marine tourism as a guide since 2003. He is committed to providing a safe, fun and educational experience with minimal impact on the environment. Gerald "Medz" Saldana joined the team in December 2017 and fits right in with the vibe of Happy Go Luckie Tours. He has many years experience as a guide and boat captain and is committed to a high quality experience for our guests. Charters include tour guide, juice and water, all snorkeling and fishing gear. Full day also includes island BBQ lunch (pack lunch for Glover's trips). Marine park fees are not included in the listed price ($10bzd per person). Visit the beautiful and pristine atoll of Glover's Reef. 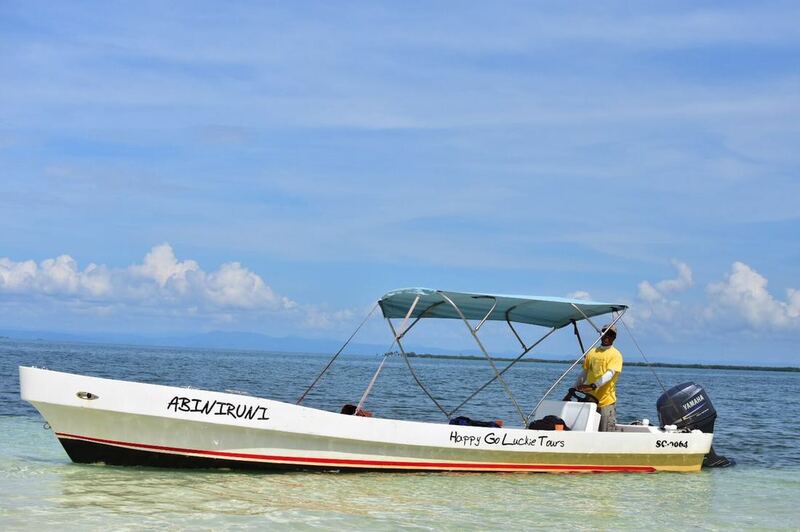 This boasts excellent snorkelling but there is also opportunity to visit the islands and do some fishing. Licenses and fuel surcharge required for fishing. Glovers is a full day excursion that starts at 8am and finishes at 4pm. Explore the many wonderful sites located in the South Water Caye Marine Reserve of Belize’s barrier reef system. You will be in excellent care with your guide. He is very patient and helpful and leads an interesting tour full of aquatic surprises big and small. Snorkel instruction is provided if needed. Set out after dark to explore the beautiful and peaceful Sittee River under a sky full of stars. Belize has many nocturnal creatures that come out after dark to the riverside to eat and drink from the river. Use high powered flashlights to spot the eyeshine of crocodiles, kinkajou, coatimundi, raccoons, birds, resting iguanas, and much more! 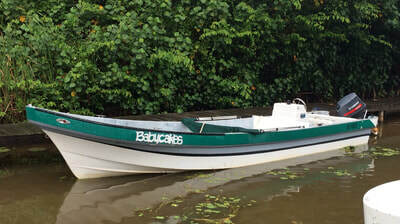 The second part of this tour involves cruising through a hand cut path from the river into the mangroves where you can spot resting bats on the sides of the trees and then out into the Anderson's Lagoon which boasts bioluminescent plankton that lights up with any disturbance in the water. It is magical to see fish darting away from predators and the boat as you cruise along. The water also glows behind the boat as the prop wash activates the chemical reaction which causes the plankton to light up. This is so interesting and intriguing to visitors that a swim in these waters is almost irresistible. This tour is seasonal and affected by rainfall and the moonlight so we only schedule during optimal viewing times. We want to offer the highest quality experience at great value. Click HERE to view our tour schedule. Cruise along the beautiful Sittee River in the early morning and see abundant birds and iguanas sunning themselves in the trees. Marvel at some of the worlds tallest mangrove trees while keeping an eye on the water for manatees and admiring the beautiful riverside properties of Sittee River Village. This is a great tour for bird watchers and nature lovers. This caye is one of only two nesting sites in Belize for the Magnificent Frigate and Brown Footed Boobie. Learn how they build their nests and attract their mates. Stop in at this little private island and say hello to the owner, Duane and caretaker, Laba and Rudy the dog. There is also some very good snorkeling off this caye. Play a game of volleyball with the locals, have a cool beverage at the palapa bar or discover the excellent snorkeling just off the island. Sip a cool beverage and enjoy the beach and crystal clear waters and sandy beach area that are shallow and perfect for small children or novice snorkelers. Take a stroll along the wooden walkways through this mangrove caye. A marine lab here hosts student groups and researchers. Another great spot for snorkelling. Visit this beautiful private island hosting an eco-resort. Stroll along the manicured pathways or stop in at the main lodge for a cool beverage and chat with the bartender under the intricate thatch roof.